I am one of the biggest fan of moon rituals. 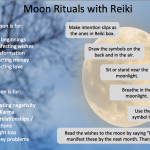 Be it full moon or new moon, I love doing these rituals. Apart from wishes being manifested, the peaceful moments of absorbing moon energy to my every cell and the inner calmness is extremely serene. Since I learnt tarot, I am getting addictive to tarot cards. I read and practice everything about tarot that I come across. Combining Tarot and Reiki has amazing outcome. 3 pieces of paper and a pen. 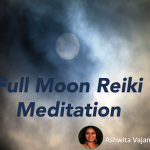 Gather all the needful materials and give Reiki to each and everything. Invoke symbols you are attuned to. Put your cards in a curved line. The first card is The Sun, middle card is The Star and last card is Death. On a piece of paper, list at least 3 things that you are grateful for that has occurred within past month. E.g.- I am grateful for _________ or I am thankful for __________. Light the yellow candle and put it above The Sun card. Read your list aloud, fold the paper and put it on top of The Sun card. Next, list all the negativity you wish to release that has occurred within the previous month. E.g.- I release _______ or I let go of ________ or I am released from _______. Light the black candle and put it above the Death card. Read your list aloud, fold the paper and place it beneath the Death card. List all the hopes you have for next month. E.g.- I wish to _________ or I desire to _______ or I aspire to _________. Lit white candle and put it above the Star card. Read your list aloud. Place your paper on top of The Star card. Let the candles burn. Meditate on the things you are grateful for, the negativity you want to release and the wishes you want to manifest. You can either let the candle burn or blow out the candle when your intuition tells you to. Tear the Death Card list. (negativity release) and dispose it somewhere outside the house. Read the blessings list of The Sun Card and keep it with you or put it somewhere safely. Read the hope list of The Star Card regularly. Read it daily for next month. well that seems a great way ton combine tarot and reiki ! will try myself next new moon (guess today is too late)…thank you !